Blake McKie is a civil litigator who represents individuals and businesses in state and federal courts. At Duffy & Young, Blake represents both plaintiffs and defendants and enjoys helping his clients obtain favorable results in a wide range of civil matters. 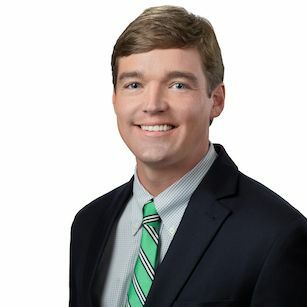 Blake joined Duffy & Young in 2017 after working in Charleston as a senior associate with a large regional law firm. Blake has valuable litigation experience in both state and federal courts and has tried a variety of civil cases to verdict. Blake graduated from Furman University in 2006 and the University of South Carolina School of Law in 2010. Blake is admitted to practice in all of South Carolina’s state and federal courts. Blake is a member of both the South Carolina Bar Association and the Charleston County Bar Association. Outside of work, Blake enjoys working on his golf game, travelling and spending time with his family. Blake is a member of the First Tee of Greater Charleston Young Ambassadors Council and the Furman Paladin Club. Blake and his wife Mary Neill have a young daughter named Louisa, a yellow Labrador named George and live in West Ashley.